Small may be beautiful, but it isn’t always easy. In fact, creating a compact new build to squeeze into a limited footprint in London, while meeting all regulations (and the high expectations of a design engineer building his own home) was a challenge of grand proportions for Joe Stuart of Warehome. This ambitious project certainly met the ‘interest factor’ for Channel 4’s iconic TV show. Occupying a plot of just 9.5 x 4 m, the house is a contemporary timber frame design using structurally insulated panels, on the site of a former coffin workshop in east London, and is the smallest 2-bed residence permitted by London planners. Apart from elegant aesthetics and ensuring a sense of light and flow in a restricted space, safety and sustainable performance were also key considerations. 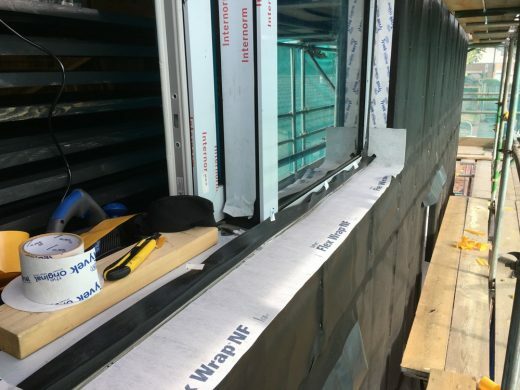 To ensure excellent wind, water and UV resistance with superior vapour diffusion, while also minimising fire risk and enhancing airtightness and thermal stability, a clever combination of Tyvek® membranes, tapes and sealants was applied to the building envelope. Among the products and systems used to achieve the performance goals of this design is Tyvek® UV Façade, a specialised all black breather membrane with excellent longevity, which allows for greater design freedom and confidence when installed behind open-jointed facades. 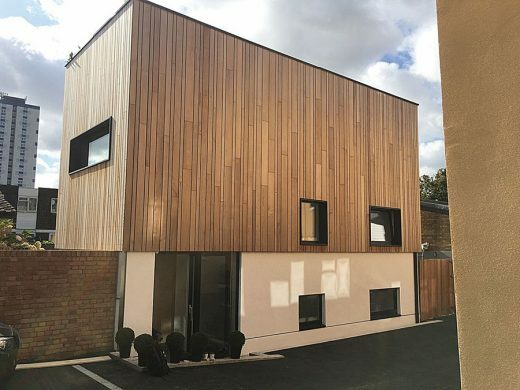 It makes the ideal ‘behind-the-scenes’ partner for the elegant Cedar cladding that Joe selected for the exterior. 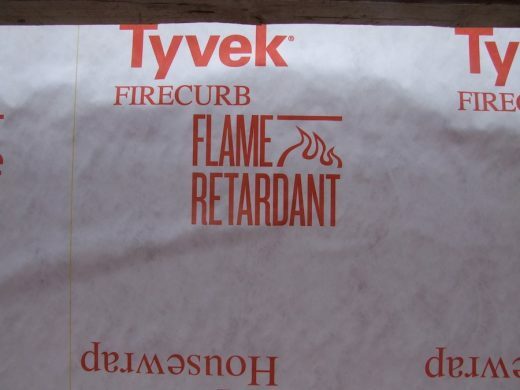 Another important element is Tyvek® FireCurb® Housewrap, an innovative fire-retardant breather membrane that has been applied to protect the timber frame structure and the foam-filled SIPS – a vital specification due to the proximity of neighbouring buildings. 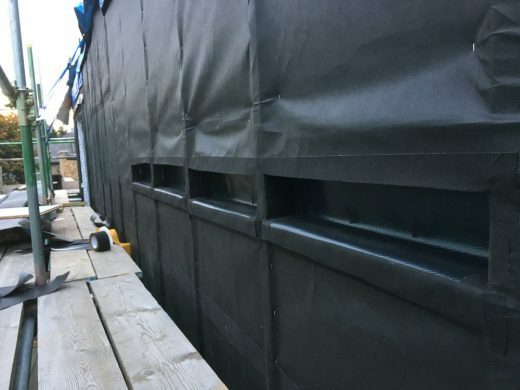 In addition, an ingenious concertina-style airtight sealant tape, Tyvek® FlexWrap NF, has been fitted to thoroughly seal awkward joints and penetrations, including the bespoke windows that Joe designed. This optimal system is completed by Tyvek® Supro, a highly valued underlay with many years of proven durability. Pictures: Joe chose a combination of advanced Tyvek® membranes and tapes to create a holistic system for the building envelope that would optimise both airtightness and thermal efficiency, and keep the structure and insulation well-protected from the elements, for the long term. These include: specialised breather membranes Tyvek® UV Façade (with Tyvek® FlexWrap® NF airtight sealing tape) behind the cladding, and Tyvek® FireCurb® Housewrap to the walls. The build took 28-year-old Joe two years to complete at a budget of £250,000, but now means that he and partner Lina can not only leave behind the ‘rent trap’ for young Londoners, but can take pride in a home they have lovingly poured heart, soul and sheer grit into creating. About DuPont™ Tyvek® & DuPont Building Membranes and Products: DuPont™ Tyvek® advanced building membranes are unique in the market due to their high-quality single layer construction. Tyvek®, in all its specialised versions, is naturally vapour open but also durably wind and water-tight. Lightweight yet robust, it is easy to install and offers long-term, proven reliability. Designed to protect the building envelope against the effects of weather and moisture, this family of membranes also offers optimal air-tightness and can help to improve the thermal performance, energy-efficiency and interior climatic stability. Tyvek® is also designed to work as part of a holistic and optimal system with a range of other proven DuPont products for the building envelope, including the DuPont™ AirGuard® advanced AVCL series, the highly versatile Tyvek® FlexWrap air and water sealing tape, plus other specialised tapes and sealants. All DuPont building products come with the renowned service, expertise and technical back-up of a world-class science company. 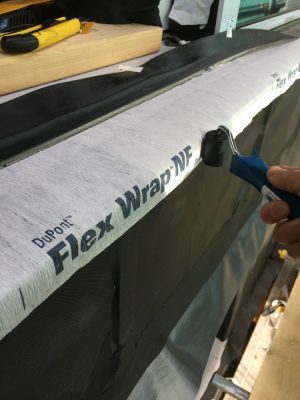 For more information about DuPont™ Tyvek®, FlexWrap® and AirGuard® please visit: www.construction.tyvek.co.uk or call 08444 068 722 in the UK and 087 922 2740 in the ROI.